MouseStation 409 - Vinylmation? What's that? On today's show, Steven Miller talks about Vinylmation figures. Also, an important announcement, a new "@ the Station" comic, Ask the Kid, a Magical Moment and this week's Twitter/Facebook poll. Recently, Mark talked with Steven Miller, Manager of Disney Trading, about Vinylmation figures. Vinylmation was introduced in November 2008 at the Festival of the Masters. The idea was to make Mickey Mouse a 3-D canvas for artwork. Now artists are designing the back, top and sides in addition to the front. While the line was aimed at boys, the first purchaser was a grandmother. Vinylmation was not meant to replace pins but rather supplement them. There are many current series out there, including Park, Urban, Cutesters, Big Eyes, Holiday and Muppets. There are limited release series sold in mystery boxes, which feature many known designs plus one mystery chaser design. There are now some open series that are sold in clear window boxes, so you can see what you're buying. There will probably be a balance between mystery and open box series. Vinylmation figures come in 9", 3" and 1.5" Vinylmation Jr. sizes. The front of the "fish" Vinylmation Jr. and sticker that Mark got from Steven Miller after their interview. Photo by Mark Goldhaber. The back of the Vinylmation and the sticker. 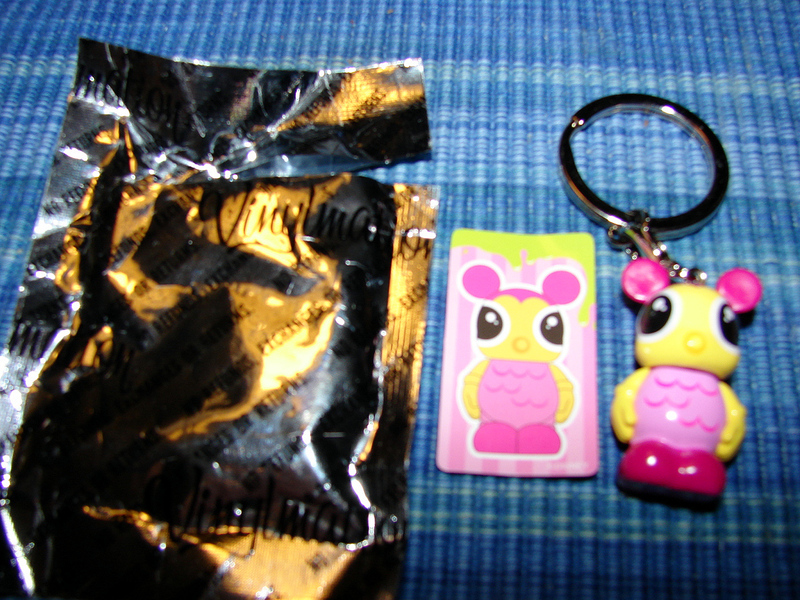 The mystery pack wrapper they were in is at left. Photo by Mark Goldhaber. There's a Vinylmation Creation Station at D-Street in Orlando's Downtown Disney, where you can design and create your own Vinylmation on a blank Vinylmation figure (available in many colors). There are even templates that let you design your own Vinylmation before you start working on the figuring itself. For a look at some of the interesting possibilities for custom created Vinylmations, you can see some in the Twitter feed of Mikey Monheit such as this one, this one and these two. The mystery chaser for Park Series 4 (link) is Colonel Critchlow Suchbench from the Adventurers Club. If you get it, please send it to Mark! He must have it! While mass merchandising generally sticks with the most marketable characters, movies, etc. for large-run items, Vinylmation and pins can put small series out there to connect with people who may not see their favorites on those large runs. 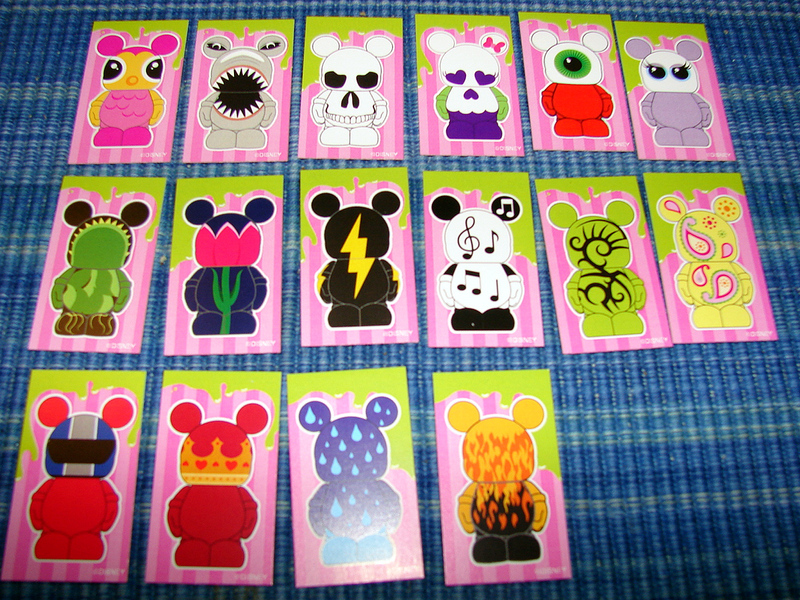 The series 1 Vinylmation Jr. trading card set. Photo by Mark Goldhaber. Vinylmation trading started at the D23 Expo to see what it would be like, and they tested mystery trading boxes of 12 pieces and had a line for two hours. People would go and buy more Vinylmations so that they could trade more. They also tested an open trade box. Trading was so popular that there are now about 84 trading locations in Florida, California and Paris with more being added all the time. They now have a mystery trading box of 24 pieces available. Some guests prefer mystery trading and some prefer open trading; the Disney trading group is still learning a lot. Trading limits are 1 per box (mystery and open) per day. 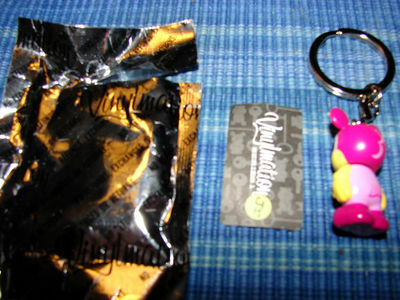 Steven actually tested a 3-inch Vinylmation lanyard but was it was just too heavy. Steven did get to witness an extra-special touch when his son was trading at the Space Mountain arcade. the key is interaction between cast members and guests. He even heard a story about someone who traded at MouseGear last year and wanted to come back to trade with same cast member. 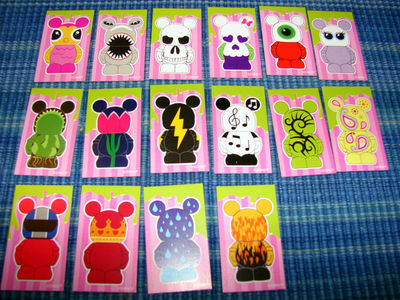 The eight Vinylmation Jr. buttons that Mark got from Steven (still mint in bag!). Photo by Mark Goldhaber. There are lots of interesting series coming, including Animal Kingdom, Toy Story, The Black Cauldron, Steampunk - The Mechanical Kingdom, Condiments, Muppets series 2, The Nightmare Before Christmas and Star Wars. The official site for the figures is Vinylmation.com (link). There are lots of great downloads including wallpaper, avatars, icons, and more, as well as a Vinylmation blog. Steven also posts about Vinylmation and pins on the official Disney Parks blog (link). You can also buy Vinylmation online at DisneyStore.com (link). For more information, you can go to the official Vinylmation site. Thanks to Steven Miller for taking the time to talk to Mark, and to Benjamin Thompson for setting up the interview. No wonder Mark's starting to go grey. Comic by S. C. Jones. The first comic in this story is in the show notes from two weeks ago. If you're looking for more information on the Gremlins, check out these two Wade Sampson articles (article 1 | article 2). You can enjoy the entire "@ the Station" series here. Mark gave The Kid the movie quote quiz sent in by Janice Albers, which he also gave to Mike in Episode 402. The Kid did not do as well as Mike, pointing out to Mark that he needed to show The Kid more Disney classic animation than he had. Maybe some day The Kid will be ready for a rematch. This week's Magical Moment came via voicemail from Vicki from Starksboro, who talked about a trip to Disneyland in December 2007, when she and her family met up with her husband's extended family (who they hadn't seen in quite some time) at the park and had such a great time that they've stayed in much closer touch ever since. Mark noted that, again, the key to magical moments at Disney involves people and relationships. Where's your favorite spot at Walt Disney World to cool off in the hot weather? Lots of love for Club Cool, Ellen's Energy Adventure, anything air conditioned and Kali River Rapids on this one. Club Station Cool. I want to add one more. Ellens Energy Adventure. Cool off and take a nap in the dark. In the entire resort, I'd say Blizzard Beach. In the Magic Kingdom, I'll usually hop from one theater show to the next during the heat of the day: Tiki's, Country Bears, Hall of Presidents, Philharmagic, Stitch, Carousel of Progress. This also is my attraction plan during rainy weather. Epcot cooling stations thoughout the park followed by a pint from the Rose and Crown. Used to be the Outer Rim Lounge at the Contemporary before they ruined it. Phooey. So now, People Mover. in my room, of course! is the big coke bottle still near the indie car speedway ?? Phiharmagic is an awesome spot on a hot day! Mike's favorite place to cool off is Club Cool, while Mark noted that he cools off so well that he often falls asleep at The American Adventure. During the discussion of Club Cool, Mark mentioned trying Beverly during an episode of Travel with Rick with Rick Howard and Amanda Tinney. You can see that episode here. What do you think of Disney Vinylmation and pin trading? We've got some important news for you this week. Due to scheduling conflicts for us here at the MouseStation, it's becoming increasingly difficult to get the show out to you each week. We're going to have to take a look at how we're recording the show and how we're doing post-production. We've been trying to work things out without halting production, but there's just no time to do that. In order to figure out what we need to do, we're going to need to take some time off to work on our schedules and to consider options. We're going to take a hiatus after the next couple of shows to use the time we usually spend recording and producing to rethink and retool the show and the production stream. Our last show before the hiatus is currently planned for Episode 411 on June 24. We'll spend that show looking at our first 410 shows and sharing your thoughts on the show. If you'd like to share your thoughts for that show, please get them to us by Sunday, June 20. We plan to be back in the fall, but we don't know what the show will look like yet, so if you want to tell us to keep or drop any part of the show, please let us know. You can keep sending us feedback once we go on hiatus and we'll consider what you say while we retool the show. We'll miss doing the show over the summer, but we need to do this to ensure that we can keep doing the show for the longer term.